New 2015 Haagen-Dazs Ice Cream Christmas Cake & WIN Some Haagen-Dazs! It’s that time of the year again – when we remember the MOON cake, the CLOUD cake and the VILLAGE cake and we wonder what Haagen-Dazs has in store for us this year. Well, the keen among you will already know that this year’s delight is the extremely YUMMY advent calendar cake. Häagen-Dazs has been making ice cream like no other since 1961. The founder Ruben Mattus’ vision was to make the best ice cream in the world using high quality, carefully selected ingredients. In recent years, Häagen-Dazs has been celebrating their tradition of craftsmanship and ice cream expertise by delighting the world with exquisite, limited edition Christmas cakes, each one of which is masterfully crafted by the chef pâtissier in Häagen-Dazs’ Paris flagship store on the Champs-Élysées. Yes, your cake will come directly from Paris without having to pay for a Eurostar ticket! Now in its 8th year, Häagen-Dazs is proud to collaborate with one of the greatest interior designers of our time, Paola Navone, to ensure that 2015’s Christmas cake goes down in memory as one of the most stunning examples of gastronomic design ever seen. Navone, who is originally from Turin, Italy, but now resides in Paris, is famous around the world for her avant-garde style and attention to nuances of colour and texture. It is for this reason that the partnership with Häagen-Dazs, who are known for their deliciously smooth ice cream and quality ingredients, is so well-matched. 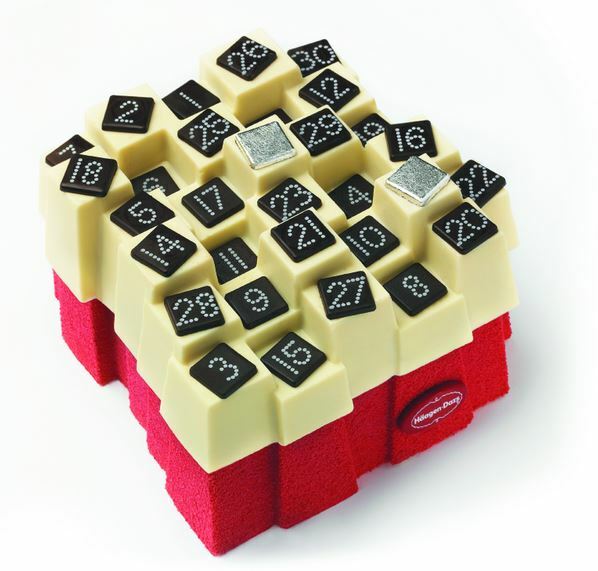 When she proposed her design for an edible advent calendar, she and the Häagen-Dazs pâtissiers had to overcome quite the technical challenge: 31 pillars of ice cream to represent the 31 days from 1st December to New Year’s Eve. What’s more, in order to make it something truly special they agreed on a sumptuous white chocolate coating, velvety base and ice cream hidden inside each pillar. The two pillars that are designed to represent Christmas Eve and New Year’s Eve stand above the rest and are covered in either edible gold or edible silver leaf. The Häagen-Dazs Advent Calendar by Paola Navone comes in two flavours: Dark Chocolate & Almond and Macadamia Nut Brittle & Dulce de Leche. Just 35 cakes will be available in the UK so really – if you want to get my favourite (dark chocolate & almond) you need to be quick. Not up for a whole cake but want some FREE ICE CREAM? Well, Häagen-Dazs have kindly offered to send FIVE LUCKY PEOPLE £10 gift certificates for Häagen-Dazs ice cream (any flavour – YUM!). Want to win some? Well just check out RaffleCopter below and cross your fingers! 1.The competition will finish as per Rafflecoptor widget on Wednesday 23rd December 2015 at midnight. 2.The selection of winner will be selected by Rafflecopter and verified by hand to ensure entry complies. 3.Only available to UK addresses. 5.I reserve the right to exclude entries that I feel are inappropriate (for example, change the tweet, share to locked account I cannot verify or do not leave the minimum 10 words) or are not in the spirit of the competition. 6.Your details will be passed on to Haagen-Dazs’ PR company so they can send you the prize. 7.I reserve the right to remove entries that I believe aren’t human created or are an attempt to gain an unfair advantage such as automated entries. 8.You do not need to complete all three actions to enter but you must use the widget and leave your email so I can contact you if you win. 62 Responses to New 2015 Haagen-Dazs Ice Cream Christmas Cake & WIN Some Haagen-Dazs! It’s hard to play favourites – I love the caramelly nutty family so it’s difficult to choose between salted caramel, dulce de leche, macadamia brittle… but then of course there is strawberry cheesecake. The regular salted caramel or the chocolate salted caramel though? Cookie Dough is my absolute favourite, I could eat the whole tub in one sitting and have been known to hide it in the back of the freezer. such an amazing flavour so creamy and moreish. Mmmm- just love ice cream. I love the chocolate salted caramel because it just melts in your mouth and tastes divine! I live the Belgian Chocolate one, the taste is amazing although the others are very good too. I love the flavour HÄAGEN-DAZS COOKIE DOUGH CHIP ICE CREAM, it’s perfect for a movie night. chocolate salted caramel its just the best!! Oh my goodness! They look divine! I love the salted caramel one! It’s my favorite ice cream ever, it’s so delicious. I could eat that one forever!!! To be honest I’ve never tried it. Would be lovely to though. I love the Baileys flavour, it’s such a special taste I treat myself to some at Christmas. I like the Spiced Pecan Turtle ice cream i get every time i go to New York. I like the coffee ice cream best because it’s lovely to finish a nice meal with coffee ice cream and an espresso coffee. 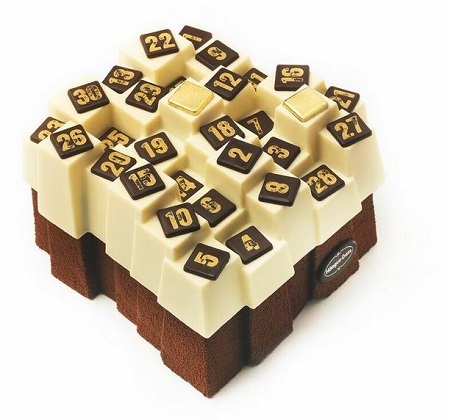 Oh wow, that is the most amazing advent calendar ever! It’s hard to choose, but I think my favourite flavour is Banana Chocolate Brownie because the combination of banana, fudge and chocolate is just sublime – I love a good banana ice cream, and combined with the chunks of brownie and the hint of fudge running through it is just incredible. I want some now! Belgian chocolate is my fave it’s just feels so naughty to eat. I just love Baileys Haagen Dazs. It’s so hard to get hold of but it’s just so creamy and scrummy. I can quite easily eat a tub of it in one go! I love the Strawberry Cheesecake flavour! (I buy it once a week!) It’s so indulgent and tastes very much like an actual frozen strawberry cheesecake. The little bits of biscuit included are the best! The vanilla is my favourite flavour – I have tried all the others but always come back to vanilla. It’s smooth, creamy and so full of flavour. I love it! I love the Macadamia Nut Brittle because it is such a lovely rich ice cream and I love it! Pralines and cream is my favourite because I love the creamy taste and the texture of praline crunch. Cookie dough – you just can’t beat it – although Belgian Chocolate is a close 2nd! I love Vanilla because you can actually taste the Vanilla pods as opposed to some chemical attempt that seems to exist in most other brands. Mint leaves and chocolate my fav, closely followed by coffee – yum! Pralines and cream is my favourite because I first tired it years ago when ‘posh’ ice cream first became popular and I LOVED it….and really it is still unbeatable. I am partial to quite a lot of them to be honest but my favourite is Pralines and Cream as I love the gooey caramel bits that are in it. cookie dough- i could eat itall day and all night! My favourite flavour is White Chocolate Raspberry Truffle, I love white chocolate and the taste of the raspberries is divine. While it has an extra bonus of the chocolately fudge truffle a must have when you have had a stressful day. My favourite is banana chocolate brownie because I love the mix of bananas and chocolate together. I love these yummy cakes and chocolates. Good to visit your blog.. Had a great time here..